NYC has a combined sewer system which overflows during heavy rain (and snow). The city relies on both grey and green infrastructure to mitigate stormwater flows. 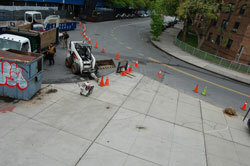 One example of the latter is the Stormwater Vegetative Control or SVC project at East 120 Street and Paladino Avenue. Nelson Villarrubia, executive director of the urban forestry nonprofit TreesNY, developed the concept. The site, pre-construction, was "barren, flooded and essentially [a] useless mass of concrete. Adjacent to a public school, at the base of the pedestrian bridge to the East River Esplanade, just 200 feet from the East River and seriously prone to flooding, the site was ideal for a stormwater mitigation project." 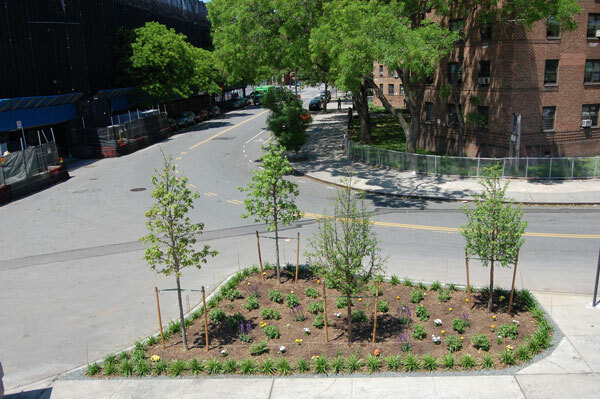 TreesNY removed 640 square feet of concrete to build the mitigation landscape which is composed of "two extra-large, extra-deep tree beds lined with gravel, filled with grasses, shrubs, flowers and fast-growing native trees." 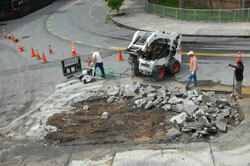 The project was funded by the New York State Department of Environmental Conservation. Update: Here is a section courtesy of TreesNY. P.S. This series is an expansion of a 2009 post about transforming parking lots to parks and permeable spaces. Sadly, it looks like a standard trees NYC planting: trees too close together and too close to the curb. Dano, thank you for commenting. 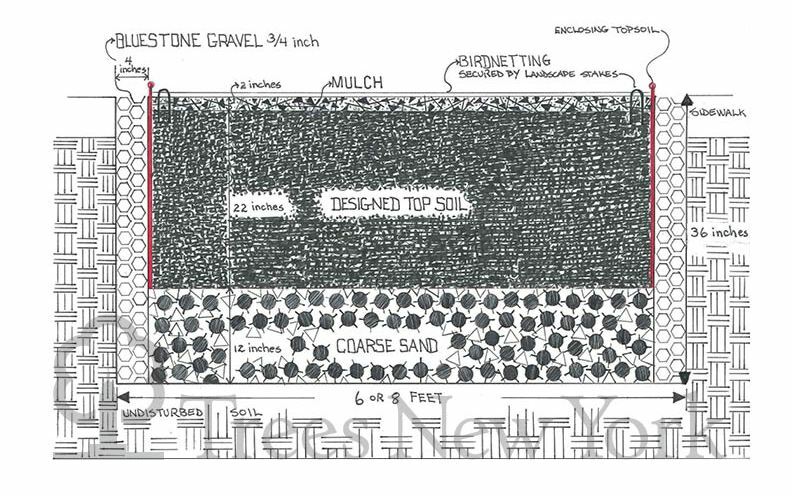 If you were to design a sidewalk stormwater mitigation project, what would it look like? Whoa, props to the construction site cleanup team. That looks like a job well done!